Advanced Dungeons and Parenting: Cure for the Dragon/Dungeon cancellation blues. Cure for the Dragon/Dungeon cancellation blues. I know a lot of people who were pretty angry with Wizards of the Coast when they ended their licensing agreement with Paizo Publications, thus ending the print publication of both the Dragon and the Dungeon magazines. Okay, I don't actually "know" a lot of people who were angry -- most my friends aren't gamers -- but I do visit the aggrosphere (message boards) from time to time. Trust me, there are some angry people out there. Dragon had been in publication for over 30 years, with one year long hiatus (which most people seem to have forgotten) as TSR was going under, and Dungeon has been around for about 20 years -- with a similar hiatus, so it's understandable that many might feel a sense of loss now that they are no longer available in print. They are becoming available as ongoing "online" magazines, but the process of migration from one medium to another has been less than rapid and equally less than fluid. As I mentioned earlier, this isn't the first time that Dragon and Dungeon were not available for purchase during their long runs. In the late 90s, before Wizards of the Coast purchased TSR, there was a period of almost a year when no issues of either (in any format) were being produced. Needless to say, current fans of the magazines have a lot to complain about and a moderate wait before the "digital editions" come close to filling the void left by the absence of these wonderful magazines. But these fans do have one very exciting replacement option available to them. Wolfgang Baur, who has in the past edited both Dungeon and Dragon magazines, has begun publishing his own quarterly magazine devoted to "the world's most famous roleplaying game." The magazine, Kobold Quarterly, began as an extension of Baur's very successful Custom Adventure series of patron sponsored gaming adventures. Initially, Kobold Quarterly was solicited as an "online magazine," but Baur was able to make the magazine a print/pdf publication before the first issue was released. This was partly due to the rapidity with which Baur's patrons, of whom I am one, became subsribers and partly due to the desire in the gaming community for a d20 based gaming magazine. I have been a subscriber since day one, as I wrote I am one of Baur patrons for his custom adventure design experiment (I write this in the interest of full disclosure). I am also repeating my patronage so that he might, just might, become a guest on my weekly podcast. Having said that, I would like to say that Kobold Quarterly is rapidly heading toward Dragon Magazine quality (it doesn't contain adventures so is not a replacement for Dungeon) with regard to both the quantity and quality of content. The first issue was reminiscent of the old Strategic Review newsletters, the second issue was like an 80s issue of Dragon, and the third (most recent) issue is approaching the high standard that Paizo set in the final days of the Dragon. In the first three issues, Baur has already expanded the content from 30 to 60 pages and the quality of advertisers has increased. The magazine has also gone from almost entirely Baur written to containing articles by leading freelancers in the rpg industry. That's quite an achievement for a one man publishing show. Before you run over to his website and purchase PDF copies of his first three issues (linked here), let me give you a rundown of their content -- with brief quips with my opinion regarding each article, but minimal spoilers. Editorial: The issue begins with the obligatory editorial which describes the goal of the magazine and the central philosophy of the publication. Ecology of the Derro by Wolfgang Baur: Picking up right where Dragon left off, Baur gives us a glimpse into the psyche of everybody's favorite mentally unstable gnomelike creatures. Underdark Encounters by Wolfgang Baur and Mark Gedak: Encounter tables were a staple of the old Dragon, back in the day, and I have always found them useful. Nice companion to the Derro piece. Princes of Hell -- Titivillus, the Scribe of Hell by Wolfgang Baur: Demons and Devils have always been a staple of D&D meta-fiction and rules. I have never been a big fan of the proliferation of devils and demons, the core rules have plenty for me, but I know they are fan favorite articles and this one (like most of Baur's other demon/devil stuff) is well written -- even if I find the topic staid. 10x10 Toon by Stan! : Comics, like devils, are a staple of the old Dragon and Dungeon magazines and Stan! was one of the stable of cartoonists who have entertained us for years in those publications. This is a welcome addition. It's Not (always) About the Gold by Wolfgang Baur: This is a top of the line DM advice article that helps DMs think outside the box when it comes to rewards players can earn in a campaign, it's more than GP and XP. Interview with Erik Mona by Wolfgang Baur: This interview is a great conversation between two significant writers in the D&D "universe." I really liked reading this, both for the areas I found I agreed with Mona and Baur about what makes the game so much fun and in the areas where I think Erik Mona is crazy. There's a discussion about "unfair traps" that sent my head spinning as far as how I try to run my own games. The Kobold FAQ: Where our esteemed editor answers questions like "Will a paper edition be available?" The answer he gave to that question is now moot, but all the other questions are still salient. The Ups & Downs of Tripping by Sigfried Trent: Is a workmanlike article about the use and abuse of tripping in your D&D game. It is sure to get your min/maxers plotting and scheming. Bolt and Quiver by Stan! : The return of the strip that ran regularly in Dungeon and Dragon. As funny as it was there. The Far Darrig by Scott Gable: Let me just say that 3rd edition D&D had far too few fey, creatures actually defined as fey that is, and this article on malicious red caps is a welcome addition. The Free City by Wolfgang Baur: The first of a regular column highlighting the default campaign of the custom adventure project, the Free City of Zobeck and the world that surrounds it. Editorial: Baur discusses shared worlds. Kobold Letters: We now have a letters column. I don't know about you, but even in the digital world we live in, I still love to read a good letters page. Then I jaunt on over to the message boards. Belphegor by Tim and Eileen Connors: The obligatory demon/devil article. Fun, but -- as I wrote earlier -- I am not the target audience. I have devils/demons coming out the eyeballs. 10x10 Toon by Stan! : Funny metagaming humor. On the Street Where Heroes Live by Ed Greenwood: That's right...issue #2 and already an article by Ed Greenwood. That's a big get, and the article is one that my CSI: Sharn game was dire in need. King of All Monsters by the Open Design Inquisitors: This interview with Wayne Reynolds, the artist who really set the tone for the Eberron setting, gives some very good insight into this artist's process and even contains a brief comment regarding Football (the British variety). The Assassin by Robert Schwalb: This article is a preview of material published in Green Ronin's d20 Freeport Companion book. The article takes the Assassin out of the realm of the "prestige class" and makes it a base class. Bolt and Quiver by Stan! : As much as I like Stan! 's humor, I'd like to see some other cartoonists work featured in the Quarterly. The metagame humor in this strip seemed a little forced. Two strips...same joke told differently. Ask the Kobold by Skip Williams: Yep, you read that right. Skip Williams, Wizards' sage and rules guru for 3rd edition, answers rules questions as "the Kobold." The advice in this column regarding miss chances provided a good basis for making some changes to how I used the miss chance in my game. Ecology of the Barghest by Nicolas Logue: Nicolas Logue is one of Paizo's most prolific, and one of my favorite, adventure authors. His article on the Barghest was entertaining and informative. The "advanced Barghest" in the article is going to give my PCs a headache. From the Outside In, Creating Vibrant Characters by Sigfried Trent: A workmanlike article for players and DMs alike who want to make their characters a little more memorable. In my opinion, more useful for DMs -- who have the burden of creating hordes of NPCs compared to the relatively few characters a player needs to make. A Kingdom for my Horse by John E. Ling, Jr.: The paladin is my favorite class in D&D, but it is too often the subject of too much ridiculous controversy. "There should be paladins of all alignments!" "There should be evil paladins!" "Why can't paladins multi-class?" All these questions seem to miss the point of what being a paladin actually entails, or the mythic origins of the character type. Paladins are by nature righteous defenders of the weak and innocent and should exist, in the D&D game, regardless of what particular religions a campaign has. Paladins unswervingly serve good, it's in the archetype. All those other things, Lawful Neutral paladins for example, aren't paladins. They are other concepts by players who want the benefits of paladinhood, but not the drawbacks. Ling's article on the "horseless" paladin is a good one. He offers alternative rules that make sense given the mythic archetype. 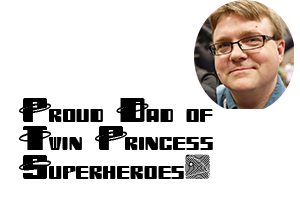 Joining the Noble Classes by Jeff Grubb: Yep...Jeff Grubb. This is a very good article that feeds on the idea of campaign rewards beyond XP and GP. The Avatar of Hunger by Wolfgang Baur: Baur provides a glimpse into the background of his second Custom Adventure project "Kingdom of the Ghouls" in the form of a really scary dragon. There's more to it than that, but I don't want to spoil Wolfgang's fun. Griffon Towers of the Margreve by Wolfgang Baur: More insight into the default Custom Adventure setting of Zobreck. Stellar cover, more prestigious advertisers, 60 pages of content. This baby is a beauty. Go subscribe now. 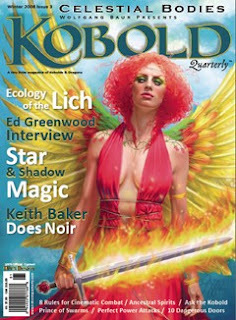 This this issue contains the Ecology of the Lich, an article on Baur's special "Star and Shadow Magic," an interview with Ed Greenwood, an excellent article by Keith Baker (creator of Eberron) discussing how to run Hardboiled adventure, and much much more. The issue just came out and I am still absorbing it, but this issue is what I hoped for when I first subscribed.